Will Smith is bowled off a no-ball from Varun Aaron. 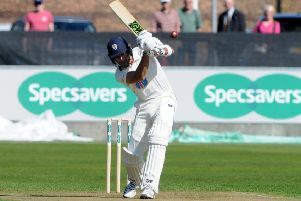 James Weighell produced a match-winning spell of 7-32 to inspire Durham to a 46-run win over Leicestershire in their Specsavers County Championship contest, triumphing for the first time after following on. Weighell was the star with both bat and ball as he made a valuable 38 runs after the home side collapsed from a strong position after lunch after a brilliant spell of bowling from Gavin Griffiths. Durham set the visitors a target of 148 runs to win, although Chris Rushworth made early inroads, taking three wickets to send the nerves jangling. Rushworth was forced off with an injury, but Weighell took centre stage as he tore through Leicestershire’s batting line-up, claiming career-best figures in first-class cricket. Weighell said: “It was a funny one really. I didn’t expect to bat as soon as I did. Then to get in with a few wickets falling wasn’t really easing my nerves as well. “We managed to get a score, which we knew was a chance with the way the pitch was behaving later on with our batting. Even with their batting in the first innings, there was a few shooting low and nipping around. 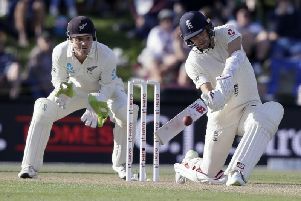 “We knew if we could get something on the board to bowl at we could have a good chance of going at it and luckily here we are now, winning by about 50 runs. It was ideal in the end. “Rushy was outstanding again to start. He didn’t bowl much of a different spell to the one in the first innings to be honest but he had a lot more luck or fortune with finding the edge and finding the pads. Then it helped me in a way to know there weren’t other bowlers to compete with. Weighell was asked about the key wickets of Michael Carberry and Neil Dexter. “Dexter was probably my favourite one, because he was looking like the one who was going to get away with all his edges and all his good shots as well,” he said. “It’s never easy thinking you’ve only got 150 on the board but if you can get the one wicket you know you’ve got a chance of the lower lads coming in who’ve got a lot of overs in their legs and a pitch that’s doing what it was doing. Weighell was delighted to learn that this was the first time Durham had won after following-on. “That’s brilliant. I didn’t know,” he added. “We were ecstatic when we got in the changing rooms and I haven’t had many feelings like that.